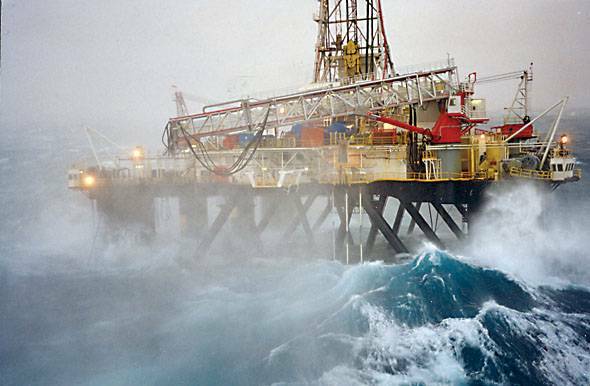 Most of the new deepwater rigs are dynamically positioned using hull mounted thrusters to maintain position and orientation rather than using anchors. 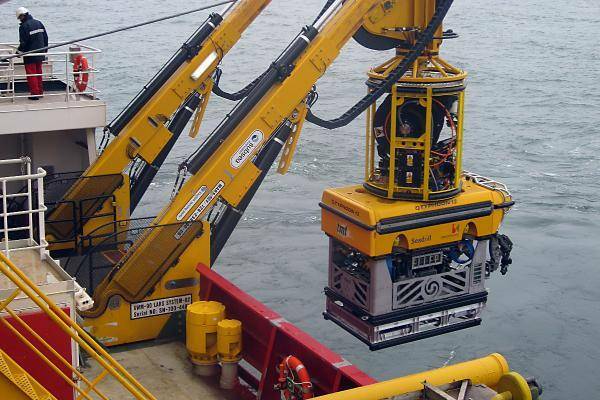 Due to the size and power of these vessel thrusters, ROV systems can be pulled towards and even into an operating thruster, which will damage or destroy the WCROV. Heavy weather launch and recovery systems move the pivot point for the umbilical from the a-frame sheave to the bottom of the vessel where the cursor will be located. This minimizes the risk of the WCROV being pulled into a thruster. The cursor is fabricated from stainless steel pipe with very few moving parts requiring low maintenance. The cursor is in the shape of an upside down bowl that encompasses the top half of the TMS and travels on a constrained path down the side of the vessel on guide wires or rigid rails. 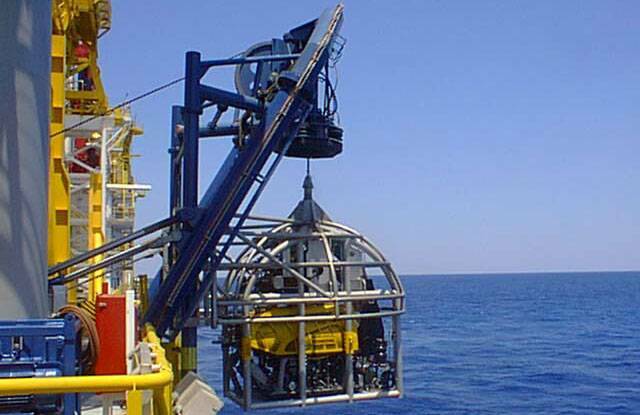 The cursor travels with the WCROV and TMS until the cursor encounters a mechanical stop at the point where the wires or rails are terminated subsea. 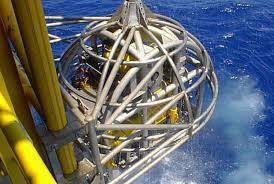 The wires or rails are terminated at the deepest possible level on the vessel structure. 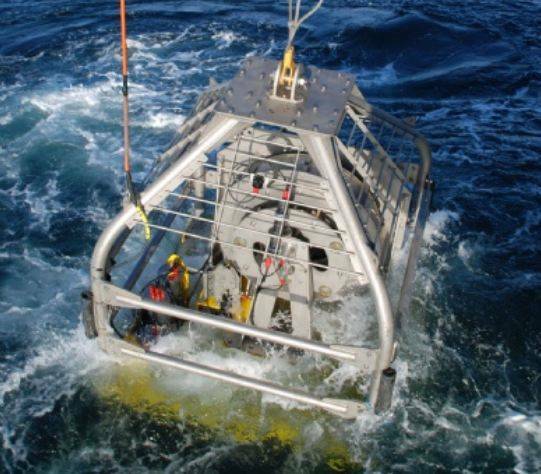 1″ holes allow the cursor to flood during submersion and drain during recovery. 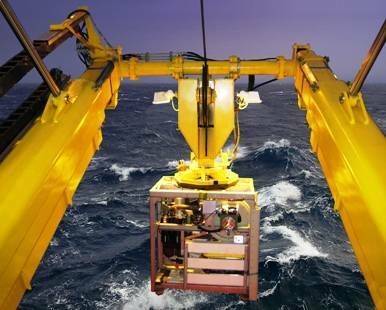 This combined weight of the cursor, ROV and TMS helps transit the entire package through the splash zone as quickly as possible to reduce “hesitation.” (“Hesitation” is the second or two that a standard system seems to float at the interface while the ROV and cage become flooded and begin to sink). 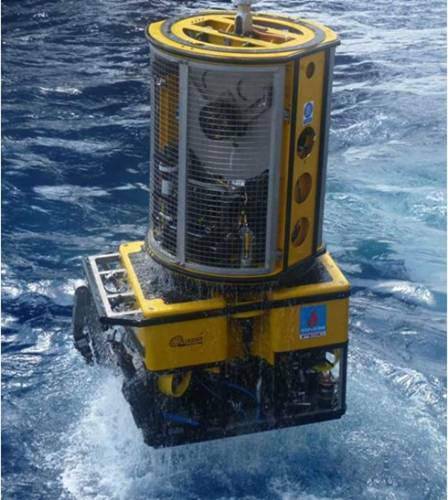 Once the WC ROV and TMS have departed from the cursor they are free to descend down to the work site as controlled by the WCROV crew.